Gold on the subway....Yes, I took these on the subway in New York- and no, I don't care if people think I'm weird for taking pictures by myself on the subway. ha ha ha...ok maybe I felt a little weird. 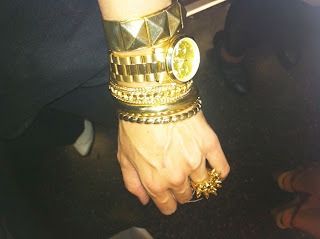 But the gold bangles are from Charming Charlie, they were under $10! 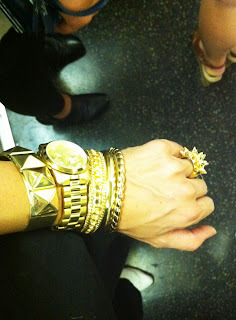 -oh and the gold spikey ring is from BCBG, it was on super clearance at Dillard's for $9! I love this ring...I wish they made it in silver too! What would do you think is a good investment item...a watch, purse, earrings, shoes??? And how many years have you used a watch?